We talked before about the reasons why NECA was re-using the mold for their Predator figure over and over, and why it wasn't just some big slap in the face of the fans, or a way to cheat us out of our money, but a necessity of modern toymaking. Well, apparently the plan is working pretty well for them, because they're just announced Series 4, which features two more Preds with some minor paint differences. So hey, more power to them. But if you're looking for something that stands out a bit more than just offering a different face or some green blood splatters, NECA still has you covered, with your choice of two stealth-cloaked Predators, each handled differently. The first was available at San Diego Comic Con 2008, as one of NECA's four summer exclusives. 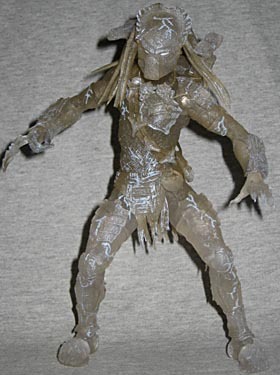 The mold is the same as the standard Predator's, of course, so everything we said about that figure is true here, as well: the skin has an inhuman texture, the musculature is good, and he's got a permanent twist to his torso. His "money shot" pose (as NECA calls it) is a bit of a squat, but there's enough articulation that you can play around and find something else. What sets this figure apart is the paint. He's officially known as the "Mid-Cloak Predator," and the paint definitely reflects that. 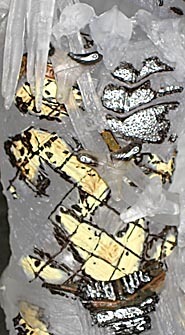 The figure is molded in clear plastic (actually, it has a small tint of blue, to make it appear more colorless than it actually is), then the surface is painted with random splotches matching the normal colors: silver on the armored sections, speckled yellow skin, brown belt, etc. The spots of color have black edges around them, to suggest the way the color is fading out. The color is mainly limited to his mask, chest and right leg, but there's also a bit of paint on his left forearm, thigh and foot, as well. Given the random spread, yet controlled use of paint, the effect is impressive. In addition to the string of skulls around his neck and the bandolier on his chest, the Mid-Cloak Predator has a few stealthy accessories. First we have the battery pack which plugs onto his back, just like on all the other figures: he doesn't have the "cleaner kit" the masked Pred did. We also get the gun that can work either as a hand-held pistol or be mounted on his shoulder - either shoulder. The promo shots suggested he'd be coming with a glaive, but no go. Oh, and of course, the pull-out arm-blades. However, he does get a few other accessories, though, that make the purchase worthwhile. The figure's based on Aliens vs. Predator: Requiem, so he comes with some Aliens. Well, some aliens-to be: a facehugger and a chestburster. 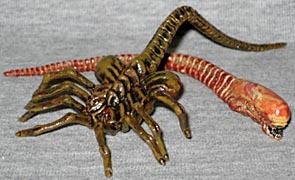 The facehugger is 4½" from toes to tail, and painted with a glossy tan that makes it look organic and wet. There's a dark brown wash to catch the details, and its mouth... thing... is red. The chestburster is 4" long, a fleshy pink color with a red wash to suggest the blood is assuredly got coated with as it, you know, burst from some poor schmuck's chest. Both these little ghouls have impressive sculpts, despite the soft materials used to mold them. Yes, soft: both have bendy tails, for minimal poseability. The paint must have been wet when they went in the tray, though, because some of it stayed behind when I took them out. The other clearish figure isn't an exclusive - he's a regular part of Series 3. Stealth Mode Predator, as he's called, is a smokier plastic than the Mid-Cloak exclusive: the entire body has a faint brown tint. It's particularly noticeable when you see him next to his super-clear buddy. 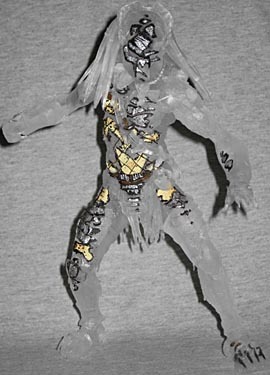 Again, the skulls, armor and dreadlocks are all the same translucent mixture. His eyes are a pearly white, and he looks like he has random lines of electricity arcing across his body. This paint scheme is movie-accurate, surprisingly. The Predator's camouflage unit got damaged or he was trying to use it in the rain or something, and this is what we saw. The sparks are alight blue, a different color than his eyes, and there's even a drybrush of blue in some spots to bring up the details. This is a nice way of portraying a fully cloaked Predator, and took a lot more thought than just cranking out a plain translucent version, like some companies every company that's ever had the Predator license has done before. Even better, you don't have to sign up for a collector's club to get this one. He may not get any xenomorph babies, but the Stealth Mode Predator does have his share of accessories. We begin with the 5" spear, and the extra hand to hold it. Yes, the left hand pops out at the wrist, so you have your choice of clutching of splayed fingers. 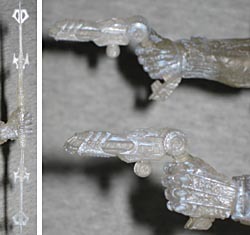 He also gets two of the gun/cannons, so you can either plug both into his shoulders or have him running around dual-wielding. Or heck, why not one of each? Even if you already have one of NECA's Predators, both stealth versions have something to offer. The exclusive Mid-Cloak Predator has clever paint apps and two stages of the Alien's lifecycle (the same creepy crawlies will be available with the Series 4 Predators), while the Stealth Mode Predator is more involved than just throwing out a glob of 100% translucent plastic. Plus, they look different enough from one another to stand out in your collection. 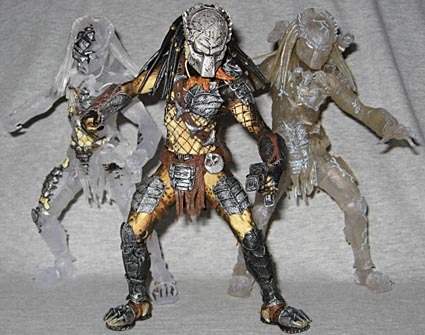 NECA keeps finding ways to make this re-used Predator mold worth spending money on, and the camo Preds are prime examples of that.